If FIFA 2008 and 2010 were to have resembled my real life, and had I started managing at, let’s say, the “young” age of thirty five, I would have retired at the age of 70, having managed Sampdoria, Newcastle United, Manchester United, Real Madrid (two spells), AC Milan, Levante, Benfica, Celtic, the Spanish National side, and Stockport County, just for the sake of it. During my long “career”, I would have won eighteen European cups, twenty eight leagues, a World Cup, who knows how many national cups, promotions and even a Johnstone’s Paint Trophy. Why am I so sad to be mentioning this? I am saying this because, believe it or not, I am not the best at computer games, I just play it to pass the time, but in all the seasons I have played, only six times did I manage to get more than 90 points. Whilst some were in Intermediate Level and Professional Level, I only managed to sum those points with: Real Madrid (once), AC Milan (twice), Manchester United (once) and Stockport County (Second Division and Championship). When I reached 100 points with County to reach promotion to the premiership, I realised I had to change my level to World Class, because reaching so many points was unrealistic and uncompetitive. This weekend, FC Barcelona won the Spanish league with 98 points. The runners up, Real Madrid, had 96 and Valencia, in third place, a “mere” 71 points. It was hard to believe. As the Real Madrid players ran on the pitch in Malaga’s Rosaleda stadium and tried to motivate each other, the Malaga players did the same. Even though fifty points separated both teams, the two of them still had plenty of work to do. However, whilst Malaga’s season had been gravely inconsistent and often appalling, Real Madrid had 31 victories, 101 goals to their tally and 95 points in the table. Yet there was no guard of honour for the merengues, in fact, the league title was still very much alive, and the team with the upper hand were 1000km away in the Nou Camp stadium. You cannot help but get the impression that this year there have been two teams who have been playing on Intermediate level in the Spanish league. How a team can finish a season with 99 points and only one defeat is beyond credence. Real Madrid still had hopes for a miracle, a win against relegation battling Malaga would only be good news if Barcelona also failed to win against Valladolid, another team fighting to remain in the top division. The hopes lasted twenty-six minutes. When Duda scored for Malaga in the eighth minute, there was still hope for yet another Real comeback, however, when Valladolid defender, Luis Prieto, scored an own goal in Barcelona, and Pedro doubled the score line four minutes later, it was evident that the title was staying in the Catalan capital. Not even Rafael Van der Vaart’s equaliser early in the second the half did much to lift the spirits in the game, and in the end, Real Madrid finished second with 96 points, Malaga were safe from relegation, Barcelona thumped the newly relegated Valladolid 4-0 and finished one point away from a century of points. The fact that Real Madrid have finished the season empty handed is going to have dire consequences, particularly since this was supposedly a season of redemption after seeing their bitter rivals Barcelona swoop six trophies and humiliate them in the Bernabéu a season before. After a vertiginous investment of more than 200 million euros on new signings, including a world-record signing and a new coach, last summer was full of optimism for Real Madrid fans. That is, until Real’s General Director, Jorge Valdano, announced that Arjen Robben had signed for Bayern Munich for 25 million euros. Then the disappointment began to sink in. Truth be told, the prospect of having Cristiano Ronaldo, Kaka and Benzema up front, with Xabi Alonso organising at the back was mouth watering, but everyone had considered the quick footed, sharp shooting Robben to be part of the new project. New coach Manuel Pellegrini even insisted in a press conference, that he considered Robben to be a key figure in his team. Valdano however, thought otherwise. Whilst Valdano stated that Robben and Wesley Sneijder’s departures were necessary, because the players themselves wanted to leave as they could not have been guaranteed first team football, and the club needed to recollect a portion of the millions they had invested in their signings, one cannot help but suspect that it was also a feeble attempt to wash away any player who could have been associated with Real’s ex-president, Ramón Calderón. The season before, nobody had doubted that Robben had been the best player in the Real Madrid squad, and even though his injuries had not allowed him to play as many games as he would have liked, he was the most dangerous asset on the pitch. Florentino Perez knew this too, and whilst he is a personality who is generally liked Madrid, his weakness is that he often thinks too much in his own image and project and does not learn from his mistakes. Figo, Ronaldo, Cristiano, Zidane, Kaka, Alonso are all players waved under his own flag, Arjen Robben however, like Fernando Redondo during his first spell, were not. The departure of Robben signalled a turning point in Real Madrid’s pre-season. Fans began to see that Manuel Pellegrino was not the manager, but the coach of the team, and unlike the circumstances he faced whilst in charge of Villa-Real, he did not have a say on who went and who stayed in the Real Madrid changing room. Despite Valdano’s claims that Robben did not have room in the first team, Real have been playing with Marcelo on the left wing, and suffered greatly when Cristiano Ronaldo missed two months of the season with injury. Meanwhile, Robben was blasting goals and making assists in the Bundesliga, and Sneijder was doing the same for Internazionale, whilst Guti and Granero were having intermittent spells. It was a miracle that Van der Vaart, one of Real’s most effective players during the end of the season managed to stay in the capital. 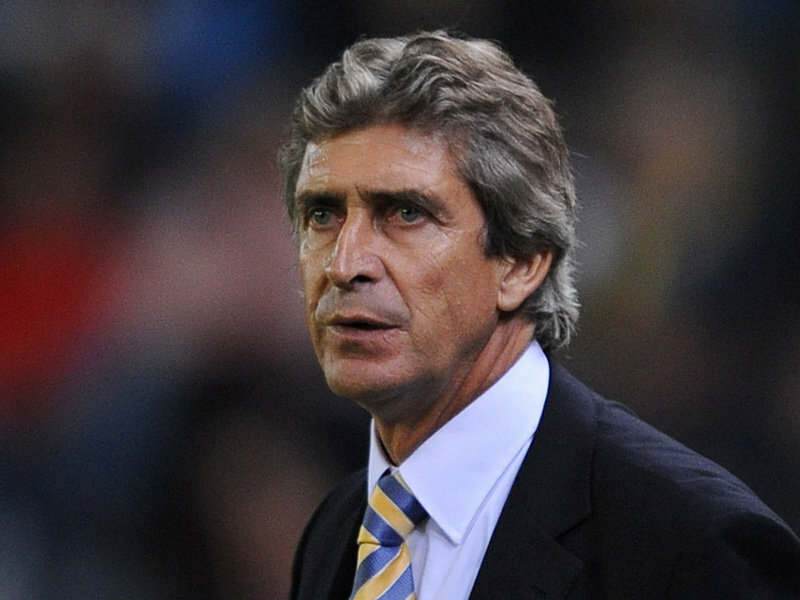 Considering these disadvantages, Manuel Pellegrini got on with the job. Even though the Valdanian intervention was enough to put managers like Carlo Ancelotti and Arsene Wenger off taking the Real hot seat, Pellegrini stayed and tried his best. Things went well until the 27th October. Whilst defeats away to Sevilla, and a 2-3 home loss against AC Milan in the Champions League one week before this game had left some sour faces on the Bernabéu faithful, the first real debacle occurred in the first leg of their Copa del Rey tie against Alcorcon, a team two divisions lower than the blancos. Despite fielding players like Benzema, Guti, Raúl, Van Nistelrooy, Metzelder, Arbeloa and Van der Vaart; Real were outclassed by an inspired and motivated Alcorcón side who took the lead in the 15th minute and were 4-0 up by the 52nd. The game would be remembered as the Alcorconazo. The following day, the powerful yet tyrannical newspaper, Marca, headlined their front page with the words “¡Vete ya!” (Go Now!). 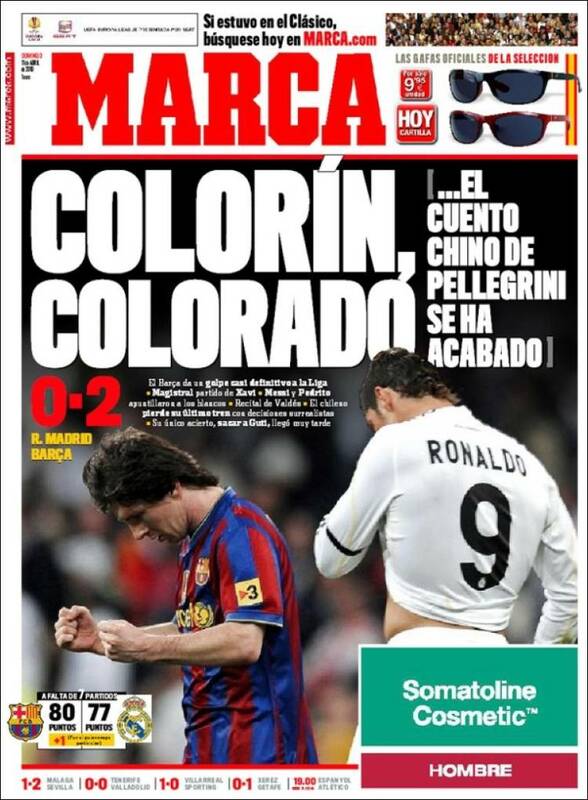 It was then that the Madrid based paper initiated their campaign against the Chilean manager. 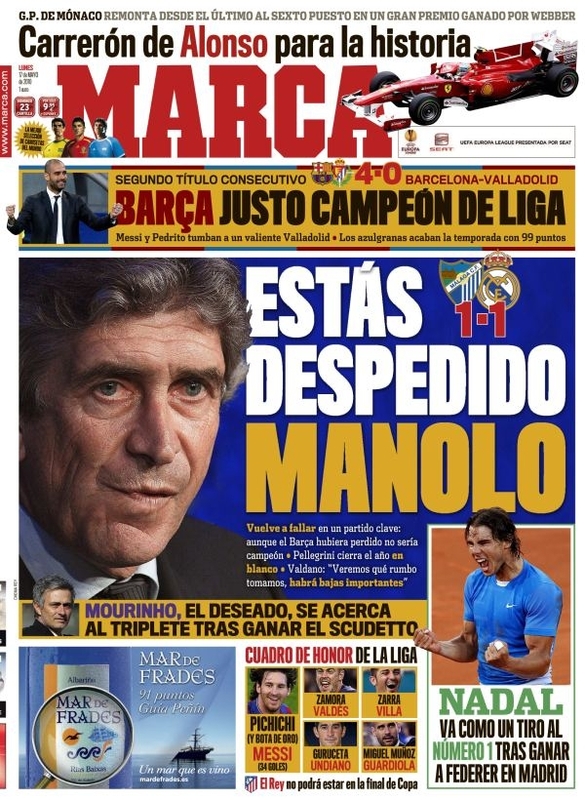 Marca's front page after the Alcorconazo, telling Pellegrini he must go. 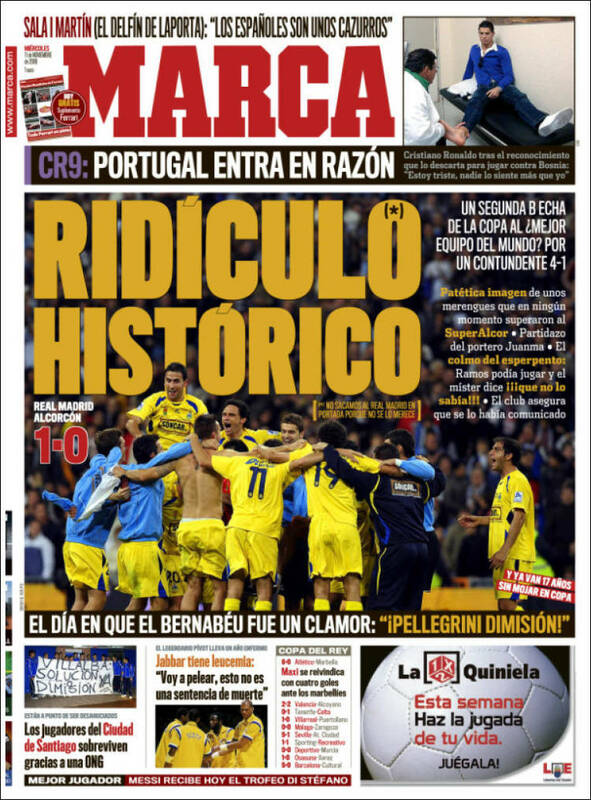 When the return leg finished with a scanty 1-0 victory for Real Madrid, Marca carried on with their purge with the headline “Ridículo Histórico”, (historical ridicule). Following the farce in the Cup, Real Madrid endured an admirable run of results where the only main slip ups were a close 1-0 defeat against Barcelona and another 1-0 defeat against Athletic Bilbao. The team also qualified for the second round of the Champions League as group leaders and were paired against Olympique Lyon, a team they were expected to beat. The return leg was just as disappointing, despite the initial hype and hope for a comeback, with Marca even publishing an interview with Real defender Sergio Ramos stating that Madrid would win 3-0, the game only lasted 45 minutes for the locals. In a first half where Real could have scored three goals, and where Higuain missed an open net, the teams went to the dressing rooms with the score at 1-0 on the night and even on aggregate. However, a radically changed Lyon took control of the game in the second half and a late equaliser meant that it was the French team who progressed to the last eight. The following day Marca continued with their campaign against Pellegrini with the headline, “Fuera”, (out), and the subtitle “Adios Champions, Adios Pellegrini”. (Goodbye Champions, Goodbye Pellegrini). The fact that Real Madrid had fallen, yet again, in the second round of the Champions League was bad enough. However, the daunting prospect of Barcelona winning the cup in the Santiago Bernabéu began to weigh heavy on the Madrid press, and even though Real Madrid were still first in the league, Pellegrini would not be forgiven by Marca´s director, Eduardo Inda. Following the defeat against Lyon, Pellegrini’s men went on to win their next five games, extending their run to eleven wins on the trot. On the 10th April, Barcelona arrived at the Bernabéu in second place in the league. Many believed that the championship would be decided on that day, and considering the fight that Real Madrid had put in the Nou Camp earlier on in the year, and the fact that they had a 100% home record, many thought that a Madrid victory was possible. The match was close and even until the 32nd minute, when Messi opened the score. From then onwards, Barcelona dominated the game, and when Pedro added a second early in the second half, many began to fear another trophy less year. Even though the league looked dead and buried for Real, two weeks after their defeat to Barcelona, the blaugrana team were held to a goalless draw in the Catalan derby against RCD Espanyol. 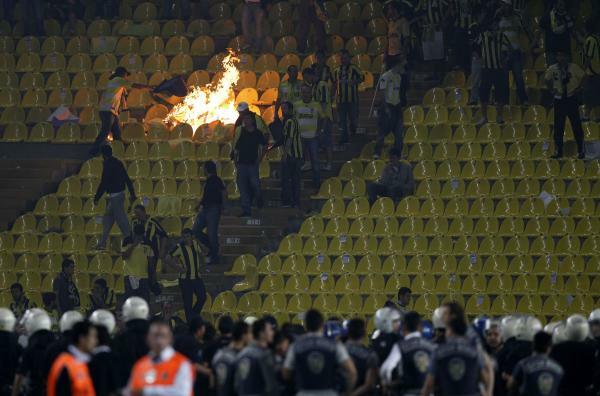 This left the gap in the table to one point, alike to the circumstances in the English Premiership. Real Madrid conjured a pact to ensure they won all their remaining games to reach 98 points, convinced that Barça would drop points at some stage, particularly against Sevilla. Real won six games in a row, with Ronaldo on fantastic form and made it to the last game of the season hoping for a miracle defeat for Barcelona. Coincidently, the Madrid sports press began emphasising the conquests of Inter Milan manager José Mourinho, highlighting how he managed to eliminate Barcelona in the Champions League semi-finals. You couldn’t help but curse their cynicism. Two years after firing Fabio Capello for not employing a gracious and offensive football style, Marca were looking to get rid of Pellegrini, the man who had obtained a historical number of points for Real Madrid whilst making them the highest scoring team in La Liga, and substituting him for a man who had played with 9 defenders during the second leg of their Champions League clash in Barcelona. Like many, I still hoped that Valdano would see sense (for once), and have patience and faith in Pellegrini. Perhaps had he bought him the left winger the team needed, and a left back, like the manager had asked, the team could have faired even better in the league, and more importantly, in Europe. Despite the initial pain and humiliation the cup defeats may have bestowed on the Real Madrid faithful, surely the 95 points and 101 goals and all attacking football would have excited them somewhat. Whilst Barça coach Pep Guardiola was stating that he “would be even prouder” of his boys if they finally lost the league with so many points, the likes of Valdano and Inda were sharpening their tools for their own version of the Night of the Long Knives. The auto-criticism that should be done in Madrid does not reside in blaming the manager exclusively. At times, several players have been languid, Kaka for example, has been far from his best, and whilst the Real defence, so commonly criticised has not been too bad, the defensive midfielder role, which Lass Diarra had taken so convincingly, began to show leaks. And with Lass on the low, players like Mahamadou Diarra, and more specifically Fernando Gago failed to impress. In the case of Raúl, his season was a disappointment, and despite becoming a bench player for the first time in his career, he still jumped on the pitch on thirty occasions and managed a scanty five goals. I will never deny that Raúl is a legend, but many fans do not scowl when they hear that he is probably going to bow down this summer. Guti proved this season that he can be one of the best players in the world, with acute passing, great slickness and passion, but as has occurred in every season he has played in, he has been prone to four or five game spells where his presence on the pitch is unnoticed. For three quarters of the season, Marcelo has been awful, predominantly when he was the main void in the Real starting eleven in the Nou Camp, however, he has improved considerably during the end of the season, and a great cause of this may be Pellegrini himself. Benzema still has a lot to learn, Drenthe has too much to learn, and Granero needs to prove that he has presence on the pitch, as it is hard to believe that he has played over thirty games this year. It is true that Pellegrini had a fantastic squad, but what has failed the most is the voids in the team, voids that he himself had signalled out at the beginning of the season and that Valdano had ignored. However, he too deserves some criticism. Almeria’s coach, Juanma Lillo effectively pointed out that “Real Madrid play to thrash you, whilst Barcelona thrash you while they play”. Perhaps this obsession with scoring created an almost gung-ho approach to the opposing team’s area that sacrified midfield creation and elaboration, and this was seen in its true light against Barcelona and Lyon. Either way, for those who have seen how managers like Arsene Wenger and especially Sir Alex Ferguson needed time to let their projects sink in, there was hope that Real would not fall into the same routine, and there was also hope that if Real showed true grit and fought all the way to the end, achieving those 98 points that even Eduardo Inda had set as “Championship winning points”, then Pellegrini would be cut some slack. However, as the final whistle blew in the Rosaleda, and the Real Madrid team trudged into the dressing room, having given up all hope on the pitch, the scant illusion that Pellegrini could die with his boots on and with pride were gone, and many of those who had found themselves defending the Chilean, saying that all he needed was time and faith began to look towards Italy and at Jose Mourinho with curiosity.